A brand concept that seeks to unite Indigenous cattle producers to grow and market their own meat under the Blackfella Beef brand has been backed by the beef industry. Professor Alice Woodhead, from the University of Southern Queensland, will be working closely with the project to see whether Indigenous-owned cattle properties have the capacity and the product to supply markets. “We will help them develop their brand, Blackfella Beef, and then it will be localised depending on how they want to do it in Queensland. Potentially, it will be a national program with Indigenous beef products marketed through Australia and globally,” Professor Woodhead said. Part of the analysis will be to identify just how many Indigenous-owned beef businesses there are in the state and determine herd numbers. “There is so much talent in rural Australia, but particularly in Indigenous properties with the cattle management skills. But it’s just not branded,” she said. The idea of Blackfella Beef was developed by the Wangan Jagalingou and Western Kangoulu Indigenous groups and has garnered financial support from Meat and Livestock Australia (MLA) and the University of Southern Queensland. Kelvin Dunrobin ABC rural news of progress in the planning. 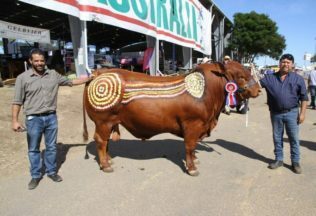 “The picture I have come up with is we’re going to have all-Aboriginal cattle ranches, and farmers and stockmen, all through the line, to sell cattle under the Aboriginal beef banner,” Dubrobin said. With Aboriginal-owned abattoirs and butchers already operating, “the sky’s the limit”. “It will be good for us to see our own mob get together again because we’ve been separated our whole lives. “So if we can get together with the same purpose, the same goal, we can get ahead,” he said.